The catch basin recess just in front of the car is 150 feet from the pedestrian zebra stripe at the rotary entrance. I’m pedaling at about 18 mph = 25 ft/s, my usual speed on that section, so the rotary is six seconds away. 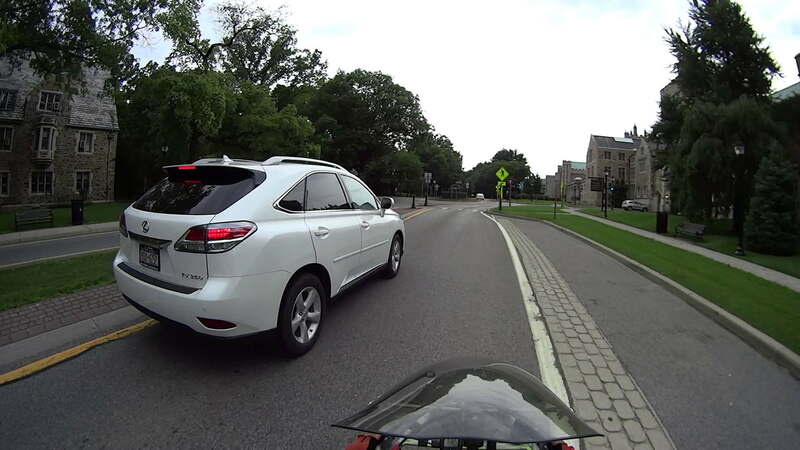 As always, motorists plan on squeezing past me and getting through the rotary before I arrive, presumably figuring that I can share the road with them both into and through the rotary. 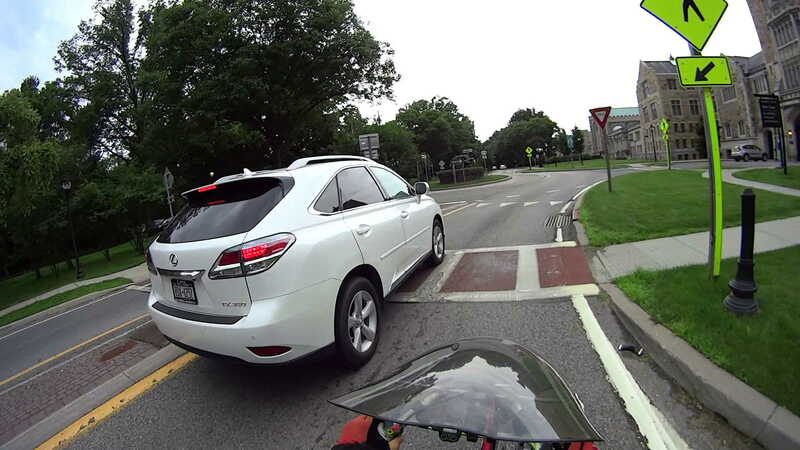 That doesn’t take into account the fact that vehicles must speed up to pass me at more than 18 mph, slow down before the rotary entrance, then veer right around the central island. Given, say, 300 feet, that’s 12 seconds, which isn’t really all that long. 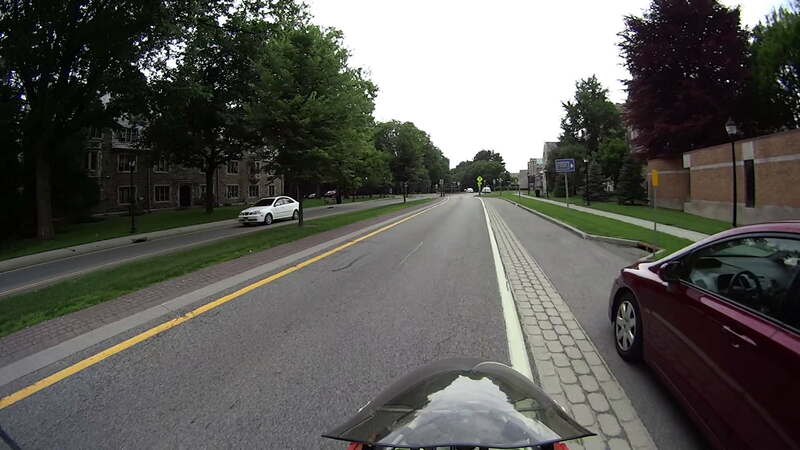 Under ordinary circumstances, I can pass through the rotary by backing off on the pedaling and coasting, without slowing very much at all, occupying the entire lane. 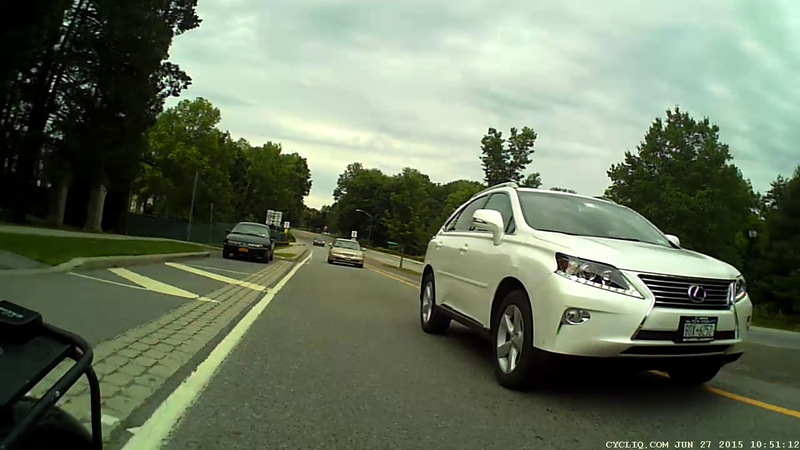 If there’s oncoming traffic, then I plan to stop at the Yield sign, an event which often takes motorists by surprise. 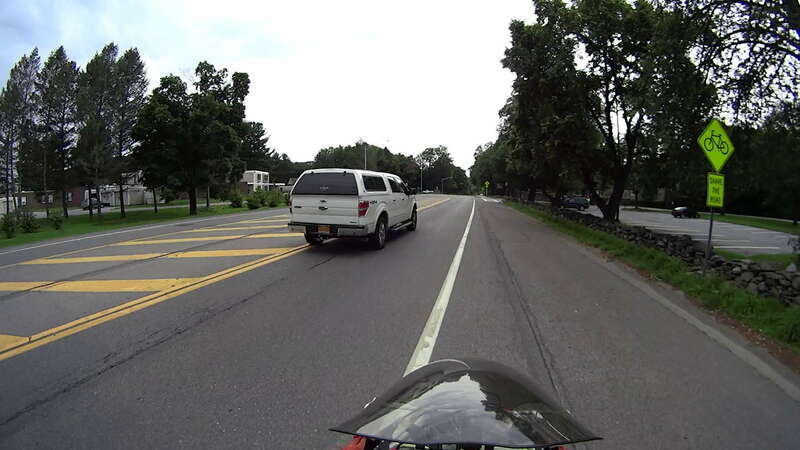 The rotary entrance lane squeeze just ahead slows motor vehicles and channels them in the proper direction around the central island, a bike-unsafe design that mashes cyclists right up against the side of improperly passing vehicles. You can’t hear me shouting “GO! GO! GO!” to encourage them to get the hell out of the rotary. For sure, I am not going to pass them on the right. As it turned out, the driver continued straight through the rotary, then parked close to the Juliet, along with the car following them, which was a few feet behind me in the last picture. I decided that stopping by the driver’s window and asking if he / she / it understood what just happened would not be a productive use of anyone’s time. Speaking of time, if seven seconds sounds ample for evasive maneuvering, bring your bike over and let’s do some riding.